First guided tour of the Versailles: around 10 am. Last guided tour of the Palace of Versailles: around 4pm. Before 11 am or after 2 pm. The palace is open and tours operate all year. We are comparing Best Versailles Palace Guided Tour Skip the Line Prices from leading ticket suppliers and Try to find you Cheap tickets prices on the market. The Guided Tour of Versailles is the package that combines direct access to the popular Versailles Palace, without inconvenient waiting in long lines, and a 90 minute guided tour. With a secured priority entry, you make the most of your time in Paris. The guided tour of the palace gives you an insight into the way of life led by the royalty and aristocrats during the times of the monarchy. While getting around, you will see exceptional works of art and various personifications of the former monarchs. Besides a guided tour of the Versailles Palace, you will also be free to walk in incredible gardens behind the building. This interesting tour is suitable for everyone who likes art, culture, opulence and beautiful landscapes. This guided tour should appeal to historians and those interested in historic politics. Your Experience With Best Versailles Palace Guided Tour Skip the Line? During the guided tour, you will explore the premises of the former royal residence of Versailles. Along the way, you will find out how the royals lived a few centuries back and witness the majesty of the Versailles Palace. Along with other interesting facts, you will get to hear the details of Louis XIV's and Marie-Antoinette's lives in the grand palace. Admire exceptional works of art, paintings and sculptures in King's and Queen's Apartments. Have a spellbinding experience in the Hall of Mirrors. Once the guided tour concludes, you are free to remain in the palace complex and explore at your own pace. Tour majestic gardens of the Versailles featuring floral paths, half-hidden spots and magnificent fountains. 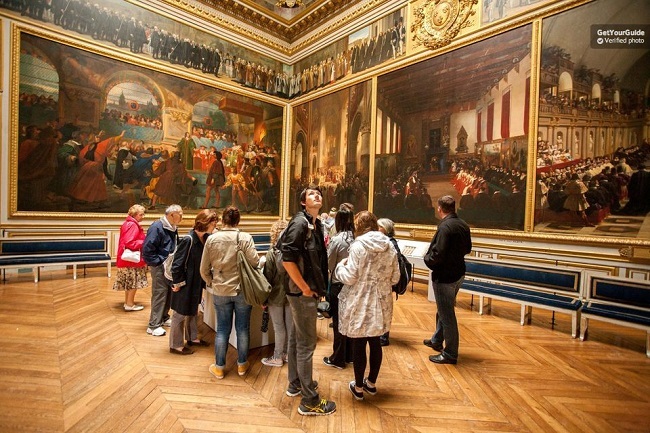 What Best Versailles Palace Guided Tour Skip the Line Includes? Priority skip the line entrance to the Versailles Palace. 90 minute guide tour os the site with a bilingual guide. Comprehensive guided tour in English, Spanish, French, Italian or German. Unlimited time to explore the palace. A visit to the Versailles Palace introduces visitors to the way of life of the royals and aristocrats during the old times. Living in an inappropriate splendour was one of the main causes that led to the French Revolution. We recommend booking your tour for the earliest departure so that you have more time to explore the Palace. Travelers Reviews about Best Versailles Palace Guided Tour Skip the Line? Traveller have had a great time whilst touring the Palace of Versailles. This activity has an average 4.5 out of 5-star rating on TripAdvisor, Viator and Get Your Guide. The comments from travellers indicate that the tour of Versailles is a walk-through history, mythology and the very best the historic artworld can offer. The guided tour of the Versailles Palace is suitable for wheelchair users. Some ticket supplies offer fully or patially refundable tickets incase your plans change. For cancellations less than 2 days (or 1 day for tickets purchased from Get Your Guide) before the scheduled tour, a refund iwill not be issues. Note that the price of the ticket may be different on days the days of garden shows. Make sure to arrive at the meeting point in time, preferably 15 minutes in advance. If you fail to arrive before the guided tour starts, you will not be able to join the tour and a refund will not be issued. Transport to and from the palace are not included in the ticket price, you must make your own way to the meeting point. Meeting Point: 10du General de Gaulle, Versailles.